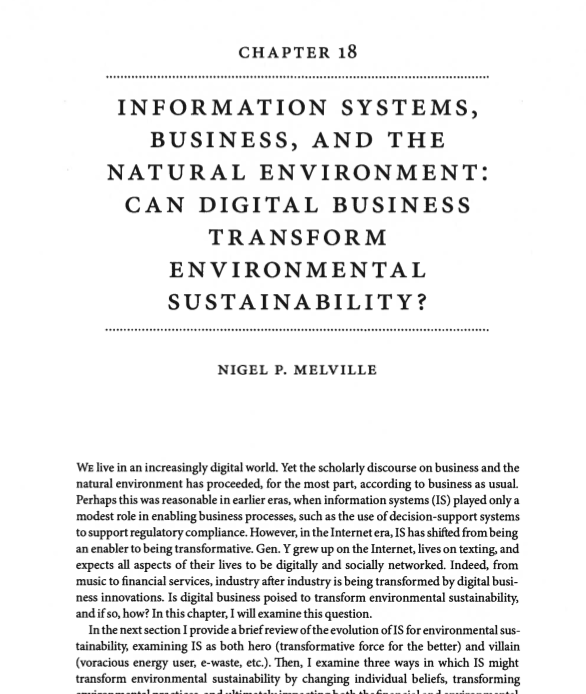 In mid/late-2000s (when I started this blog), the role of digital information systems seemed to be an afterthought in the corporate environmental sustainability conversation (no sources to back this up: just based on my own observations. exception: Peter Graf at SAP). It’s one of the reasons I started this blog. Digitization transformed organizations and enhanced corporate financial performance in decades past (and continues to do so). Likewise, digital systems enhance/transform corporate environmental performance (reduce carbon emissions, raise energy productivity, enhance water stewardship, etc.). Mainstream corporate sustainability appears to be waking up to this enormous opportunity. Who should lead such strategic initiatives? Which specific technologies are most effective in which contexts? How to determine ROI of such initiatives? How to bridge the culture gap between industrial ecologists/facilities and IT personnel? Categories: Industry Trends | Permalink.